I have always dreamed of going to Japan! Visiting the land of Hello Kitty was always on the top of my bucket list and this year it finally happened! After a lot of planning and research, I was on my way to my ultimate Hello Kitty vacation. The best way to kick off my dream Hello Kitty trip was to find the right flight and it seemed only appropriate that I take the Hello Kitty Jet by Eva Air. The moment I got to the airport, my excitement already started to peak. Eva Air’s checkin counter at LAX even has Hello Kitty signs for the baggage drop as well as their other checkin lines. I already knew I was off to an amazing trip! When I got to the counter, the folks at the Eva Air handed me Hello Kitty and friends luggage tags as well as the cutest boarding pass ever. Hello Kitty, My Melody, Pompompurin, Badtz Maru and Little Twin Stars were on my ticket to my dream plane. After going through security, finding my gate and much eagerness and excitement, I finally spotted the cute jet. Eva Air flies several different Sanrio Jets and the one I went on was the Sanrio Family one! I really liked this one because it features a lot of Hello Kitty’s friends including Patty and Jimmy, Keroppi, My Melody and even Dear Daniel. As all of us lined up to our various boarding zones, I noticed that even the zone signs the Eva Air crew was holding was decorated in Hello Kitty! I loved all the details and this wasn’t even when I was inside the plane yet! Once I boarded, it was even more cuteness galore! Every seat had a the head rest covered in a Sanrio Family head rest cover and there were Sanrio Family pillows for all. Within each seat, there were even Hello Kitty waste bags as well as safety manuals featuring our favorite Sanrio characters. The kawaiiness even continued on in the lavatory. The hand lotion, aroma mist, facial mist and hand soaps were all in bottles with Sanrio family characters. Even the mouth wash cups were Hello Kitty themed. Once the flight started, the cuteness didn’t stop. When it came time to have our snacks and complimentary drinks. There was a touch of Hello Kitty everywhere. The mixed nuts had a Hello Kitty wrapping. Similarly both the hot and cold drink cups featured Hello Kitty! When it came to having our main meals, there was also Sanrio Family utensils, placement, toothpick and wipes. The Hello Kitty happiness continued throughout the flight as they offered the various complimentary drinks in the Hello Kitty cups. This was truly the best way to kick off my Hello Kitty trip of my dreams! Coming soon on my next blog post is the next phase of my Hello Kitty ultimate dream trip. For smiles, please see my Yelp review on the Hello Kitty Eva Air Jet. Hello Kitty has always been grand and now she’s about to bring supercute to a whole grand new level via the Hello Kitty Grand Cafe at the Irvine Spectrum! This September 14, 2018, Hello Kitty Grand Cafe will be opening up at the Irvine Spectrum Center in Irvine, California. The Hello Kitty Grand Cafe is the first and only permanent cafe in the U.S. 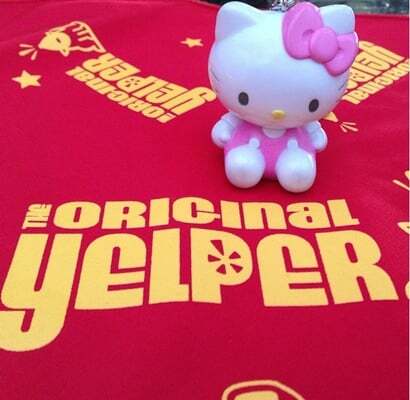 It is sure to bring lots of joy to Hello Kitty fans both here in the US and around the world. The cafe will feature several amazing Hello Kitty icons, pink decor, cute walls and special one-of-a-kind artworks. We’ve all experienced the joy of the Hello Kitty Cafe via the Hello Kitty Cafe Truck, Hello Kitty Cafe Pop-Up Container and Hello Kitty Mini Cafe. Here at the new Hello Kitty Grand Cafe they will offer many of the popular Hello Kitty Cafe menu offerings that we have come to know and love. Aside from the popular well-known menu offerings there will be even more! The cafe will have exclusive new menu additions that include made-to-order mini hot donuts (cinnamon sugar; matcha; cookies n’ cream, $6 per cup) and a pick-your-own 4pc set of Sanrio character mini cakes ($15). My Melody, Chococat, Tuxedo Sam, Keroppi, Hello Kitty cakes galore await us all! There is also a very special surprise at the Hello Kitty Grand Cafe via The Bow Room! The Bow Room is a hidden reservations-only area where guests can enjoy afternoon tea by day, and cocktail service by night. The Afternoon Tea Service is $55 per person and is available via reservation only on Wednesdays through Sunday. The yummy and cute menu will have a variety of fresh seasonal fruit, savory tea sandwiches and sweets! There will even be Hello Kitty shaped sugars. The tea selection includes a wide array of black, green, oolong, and caffeine-free tea. There will also be a special birthday blend. Tea time with Hello Kitty is sure to be a relaxing and lovely. Sweet delights include buttermilk scones, mini cupcake, raspberry macarons and chocolate chocolate cake and my favorite Hello Kitty mini cake. When night-time hits, The Bow Room at Hello Kitty Grand Cafe will become a cocktail bar for guests aged 21 and over. Reservations are for 5:00 p.m. nightly; Wednesdays through Sunday. A curated wine list ($10 – $63) will also be offered and it will have sparkling wine, champagne, pinot grigio, pinot noir, sauvignon blanc and rosè by the glass or bottle. There will also be select by-the-bottle offerings ($35 – $87) that include Hello Kitty Sparking Rosè, Hello Kitty Pinot Grigio, Hello Kitty Prosecco, and Piper Heidsieck Cuvee Brut. One is sure to have a sweet day and night at Hello Kitty Grand Cafe. Hello Kitty Grand Cafe, you had me at Hello…..
Hello Keeping Up With Hello Kitty! April is in full swing and Hello Kitty is having lots of fun this fourth month of the year! She has some very special treats this month for every one! This Hello Kitty Foodie blog post is all about all the supercute collaborations that are sure to bring sweetness to your April. For the little kitties; we have the cutest collaboration of the Summer! Today O’Neill and Hello Kitty had their launch party “Hello Kitty Glam” Jack’s in Corona del Mar to launch a new swim, sportswear & accessory capsule for girls sizes 2T – 6. Inspired by vintage aloha, the O’Neill ♥ Hello Kitty collection will hit retail at select Sanrio stores, as well as O’Neill and Sanrio.com on April 11. For The Sports Fanatics and Collectors; there are two very special sports events coming up! Hello Kitty is joining the NBA and the MLB in back to back nights at the L.A. Clippers on April 7 and the L.A. Dodgers on April 20. Purchase the Hello Kitty Package at each event to receive the limited edition Hello Kitty Clippers Cushion and the Hello Kitty Dodgers t-shirt. For all of Hello Kitty friends and family; one can spend a day with the entire family at Tanaka Farms for their Strawberry Tours! Hello Kitty and Sanrio friends will be incorporated into the educational programming provided by Tanaka Farms and at the end attendees will be able to pick their own batch of delicious strawberries to take home. Last but definitely not least, for all the Hello Kitty Foodies; there is one special treat that includes great beaches and Hello Kitty sweets! The Hello Kitty Cafe Pop-Up Container is moving to San Diego. They are opening at Fashion Valley Shopping Center on Thursday, April 12, with grand opening festivities scheduled to run from Friday, April 13 through Sunday, April 15. Look for daily customer giveaways during opening week as well as a special strawberry season menu, featuring items such as a Strawberry Tart and a refreshing strawberry drink. No fooling’ April is here and Hello Kitty is a big part of it!